You love coffee, we love coffee, and we don’t believe that just one day is enough to celebrate the joy of a great cup of coffee and the good that ethically sourced coffee brings to families around the world. What’s a coffee company to do? Well… we’ve decided to buck the trend, go against the grain, and EXTEND the coffee appreciation to a full week-long event. How are we doing that? By extending our own celebration! If you recall, we initially shared how we wanted to celebrate National Coffee Day with you. We’ve decided to EXTEND the sale through Saturday, October 4th, making it a FULL SIX DAYS of “National Coffee Day” here at AJ Coffee Company. We are sure you’ll agree, that great coffee is worth celebrating for more than one day. That’s why we’ve extended our offer. If you missed it on Saturday, there’s still time! That’s 25% Off ALL coffees through our web shop when you check out using the coupon code ‘NTLCOFFEEDAY‘ ! Click Here to get YOUR bag of delicious, ethically sourced, fresh, artisan roasted specialty coffee. 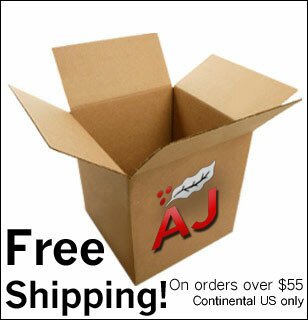 This is a fantastic deal, and it won’t last long! 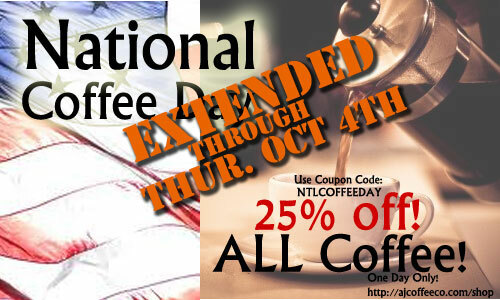 25% Off, National Coffee Day, National coffee Day Extended, Sale.